The day that everyone celebrates by drinking green beer (also known as St. Patrick’s Day) has passed, and my thoughts have turned to spring and Easter. In my home, that means adding some festive touches to the decor. If you follow me on Instagram, you know how much I enjoy browsing (and shopping) the dollar spot at Target. I mean, who can resist some of those great finds priced at $1, $3, or $5 price points! 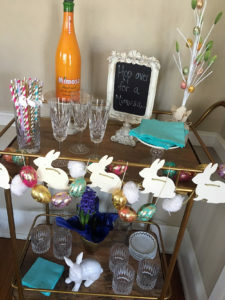 Recently, I spotted some great items for spring decorating…gold speckled egg garlands, paper straws, porcelain bunnies, and wooden bunny garlands. After loading up my cart and paying, I headed home to put these items to use! First, I adorned the edge of my bar cart with the two garlands. 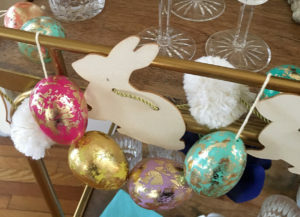 I intertwined the gold speckled egg one (aren’t those colors just beautiful) with the more simplistic wooden bunny one (I just love those white pompoms between the bunnies). I love how they look together! 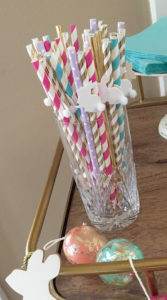 And those paper straws I mentioned…how cute are those bunny shapes attached to them! They even have little pompom tails! 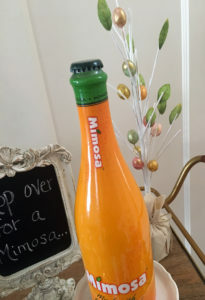 I know most people don’t use a straw to drink a mimosa, but they make a darling addition to the bar cart. My other Target find was the small egg tree…the eggs have a similar gold speckled look as the egg garland. 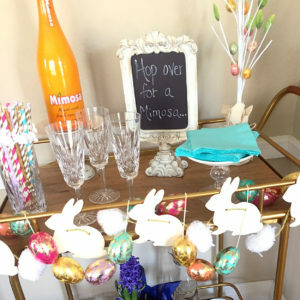 It adds some whimsy to the top of the cart, mixed in with glasses, napkins, and the all-important mimosa! 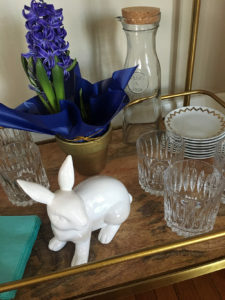 A few more decorative touches to the bottom of the cart…a white porcelain bunny and a grape hyacinth plant, along with bar cart necessities of glasses, appetizer plates, and napkins.